This is long overdue, but following on from my interview all those months ago with Matthew Glanfield, one the creative minds behind Dark Potential, I got to take a look at a set of the toys from Dark Potential. Specifically the Reclaimers. The Reclaimers, for those not in know, are the descendants of the crew aboard humanities fleets. Born and raised on board space faring vessels, their bodies have adapted to a life spent in zero gravity and as such need exo-suits to be able to survive on Earth’s surface. So they’re all a bunch of weeds. But weeds with big shiny guns. So what’s in the box? Well 7 Reclaimers including a captain, an initiate squad (a leader and 3 blokes), a forward observer and a redeemer. Which presumably is the chap with the big gun. 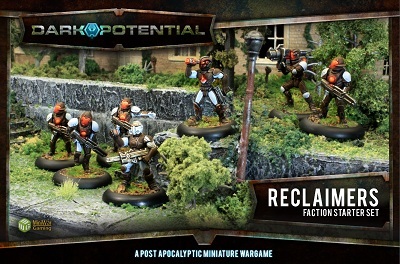 As I haven’t (yet – hint hint) read the rules for the Reclaimers, I can’t comment on the rules but the look of the Reclaimers is pretty cool. I love the Iron Man/Crysis mash up going on with the exo-suits and the fact that they’re all all slightly different as if built, or at least maintained, by their owners rather than something off a production line. It’s a nice touch. They’re futuristic but at the same time have a twist of the ramshackle. Which I like. The weapons I’m a bit mixed on. Partly because I don’t know what any of them do and because MiniWarGaming went for a very ‘alien’ feel. It’s not a bad thing, I just have to assume they’re some sort of energy projectors. The Redeemer looks a little…old fashioned, I guess is how I’d describe it. It reminds me of the Space Marine missile launcher from second edition Warhammer 40,000. It’s not really a complaint, it just seems a little at odds with the small arms which are, by comparison, very high tech. Of course it could be some super sci-fi mega weapon of face kickery for all I know but there we are. Being honest, which is kinda my thing, I don’t like the forward observer. I understand why it was designed the way it was but it makes the model feel 20 years out of date, the pistol and view finder especially being quite lazy sculpts. I’m sure he’s pimp in the game but he just doesn’t do it for me. Not, at least, whilst striking a mighty and heroic pose fresh out of a 70’s comic book. The quality of the models is pretty good. What mould lines there are, are very slight and don’t run over anything too important and/or lumpy so that’s a bonus. I like sensible casting. The arms and heads also fit the models nicely, although make sure you marry up the rifles to the bodies before you start gluing as it’s not immediately obvious what goes where. All in all the models aren’t bad. They look cool and the weapons are largely on the good side of different. I like where MWG drew their design influences from, but I do wish they hadn’t rushed the observer and that the captain wasn’t holding a Pokeball. I also wish they weren’t £40 a box which is a pretty tall order for 7 metal models with cheaper models with comparable quality in the market. It’s difficult for me to find justification in a price that makes GW & Hawk Warmgaes, by comparison, seem good value. The models are cool though and I’m sure the game is good but right now with those prices I wonder how far it can go without a Kickstarter or some such to really give the investment to release a wider range that hopefully has a lower cost per model.